Hummingbird feeder | Living life in the carpool lane.. Earlier this week, we put a hummingbird feeder up in our backyard. It’s the most entertaining thing we’ve put up in a long time. We purchased the feeder at the Home Depot. 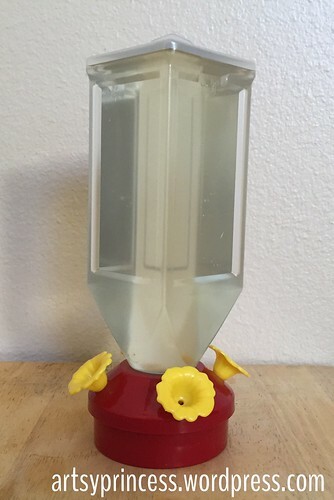 It was one of the cheaper ones they sold because we weren’t even sure if we would attract any hummingbirds. 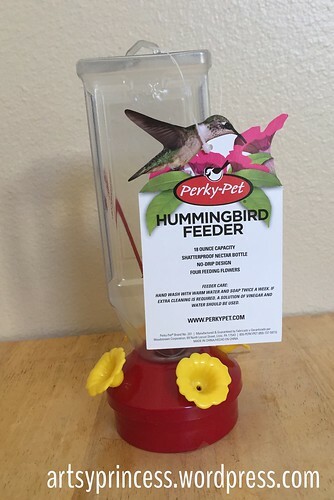 This feeder did not come with it’s own food so I looked up several recipes on Pinterest. Each one had the same ratio of water to sugar. 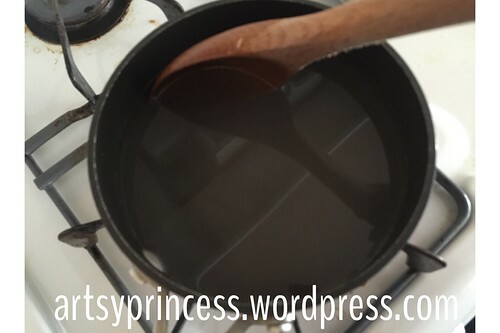 Some recipes asked to add a few drops of red food coloring. There were several pins that stated that the red food coloring was bad for the birds and that they would be attracted enough by the red plastic on the feeder. So I decided to omit the red food coloring. 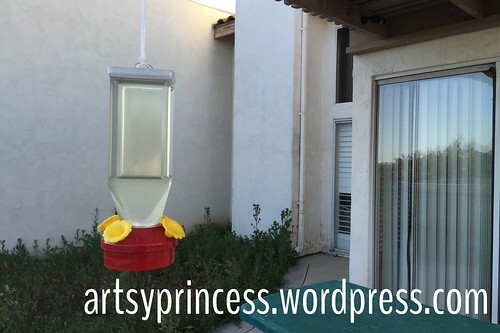 Once I filled up the feeder with the nectar, Hubby hung the feeder up in the backyard. M was very excited to finally see the feeder up. I told her that she needed to be patient. Hummingbirds didn’t know that the feeder was there and that it might take awhile before we start to see some. I was wrong. Within two hours of the feeder being up, we started getting hummingbirds. It was amazing. Since then, we’ve gotten a steady flow of hummingbirds coming to feed. It’s been great dinner entertainment. M gets so excited to see the hummingbirds feed. It’s really so much fun to watch. M tells me that I make the best nectar in all the neighborhood. I like to believe that’s true.